NEW Design! Creative Station Lite uses 5 inch Creative Station cartridges PLUS the new 3 inch adhesive refills. 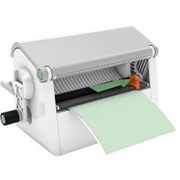 Includes Permanent adhesive cartridge - preloaded!